It is a tradition here on AVC to do a top ten albums of the year post. I've been doing it ever since I started blogging back in 2003. I will do that again this year. A number of readers have been emailing and tweeting me wondering where the post is. I plan to do it when I'm on vacation next week. But this year I am going to do a few more music posts. In honor of the end of the decade, I will also post the top ten records of the decade. And in a nod to the fact that the single is the new album, I will also post my first ever top ten tracks of the year. It turns out that the post chrstmas week is the biggest music purchasing week because of all the iTunes gift cards in stockings and under trees. So don't spend all of your iTunes stored value until you read these posts this weekend. There's gonna be some good music on them. My two girls finished middle school without ever learning how to write a single line of code. My son will finish middle school this year and he will be different because several years ago, we connected him with an ITP graduate who has taught him programming and also UX and UI design. But if we had left it to our middle school, he'd be in the same camp as my daughters. This isn't entirely the fault of the school my kids go to. I've asked around and computer science classes in middle school are not very common. We continue to teach our kids French but we don't teach them Ruby On Rails. Which do you think will help them more in the coming years? Today, introductory courses in computer science are too often focused merely on teaching students to use software like word processing and spreadsheet programs. The Advanced Placement curriculum concentrates narrowly on programming. We’re not showing and teaching kids the magic of computing. Introductory courses in programming should not happen in high school anyway. They should happen in middle school, around sixth grade. And they should allow kids to write software and make things happen with code. I remember the first time I wrote some code, hit compile, then run, and the computer did something I had instructed it to do. It was as Janice says "magic". I was smitten and have remained so almost forty years later. If the Obama administration wants to really do something about jobs and retooling America for the 21st century, it would fund the development of great middle school programming curriculum. It would fund training teachers to teach that curriculum. It would get millions of kids writing code before they have their first date. That would change a lot of things. Trading Deals, A Lost Art? Bijan wrote a good post yesterday called We Gotta Do A Deal Together in which he outlined the common practice of VC's showing each other investment opportunities. That's how I got to know Bijan. He showed us Tumblr. And we reciprocated with Twitter where we serve on the board together. We have five investments in common with Bijan and his partners at Spark Capital, including Bug Labs where my partner Brad first started working with Bijan and his partners three and a half years ago. So that's a success story in the world of VC deal sharing. But I think this practice is becoming a lost art. When I got started in the venture business in the mid 80s, this was a very big part of how the business worked. VCs would work in packs, called syndicates, and they'd trade deals back and forth all the time. When you had a deal to syndicate, you'd ask your partners "who do we owe one to right now?" It still happens but there are bunch of reasons why it happens less. Let's start with the healthy reasons it isn't happening as much. 1) Entrepreneurs have all the cards now. They typically control who invests in their companies and they pick the VCs they want to work with. There is a lot more knowledge out there about VCs, which ones are good to work with and which ones are not. We cannot tell an entrepreneur to take money from Bijan and his partners at Spark. We can suggest it, and sometimes they choose to do that. But it is the entrepreneur's call these days, not ours. That's a good thing. 2) VCs are working harder than ever to figure out what are the most attractive investment opportunities. The best VCs go out into the market and figure it out. They don't sit back in their offices waiting for the calls from their friends in the business horse trading deals with each other. That is also a good thing. But there are some not so good things at work here too. 1) There is too much money in the venture business. Many VC firms want to make large investments and obtain large ownerships. It is very hard to build syndicates these days. It used to be that the first round would be for 40% of the company, with two firms splitting it. We see most first round deals for 20-25% of the company these days. That is very good for the entrepreneur but not good for syndicates. It is more common to see a VC firm to do the entire first round by themselves or with angels, than to see two firms splitting a first round. 2) The markups between the first and second rounds in the best deals can be large. So if we turn to our friends in the VC business and say, "here's a good deal, but you have to pay three times what we paid less than a year ago", they are not always going to look at that as a favor. They might think we are taking advantage of our friendship not facilitating it. We are thinking about several follow on financings in our portfolio right now. And as we walk through the options with the entrepreneurs, I am often tempted to do the round ourselves (or with our syndicate partners if we have them). If we can make a deal with the entrepreneur that both parties are comfortable with, we keep the team focused on the business and off the road. We keep the company from educating other VCs about how good the opportunity is and less likely to fund a competitor. And we can build a larger position in the company for ourselves and our investors. We are not the only VCs who are thinking this way. This "do it ourselves" approach has been prevalent in the VC business for over a decade and is gaining even more adoption as VCs figure out how to make money in the new environment we all face. I don't want to give the wrong impression with this post. Our firm, Union Square Ventures, has and will continue to syndicate deals with other venture firms. If you go through our portfolio, you'll see that we have VCs as co-investors in 22 our 29 announced investments. In the others, we have angels as co-investors. We like to invest with others and continue to try to do that as much as we can. But I feel like we are doing it less than before and I feel like we'll do it less going forward unless something changes in our business or the venture business as a whole. I've experienced this kind of behavior over the years and I have to say that it is one of the most irritating things a person can do. I have and will hang up on the person when they show up on the line. I would not hang up on the assistant however. This behavior basically says to the person being called that their time is not as important as the person placing the call. I really don't care if its Barack Obama calling, I don't think this kind of behavior is acceptable. It is plain and simply rude. I can promise you that I would never ever consider having someone place my phone calls for me (unless I was handicapped and couldn't physically do it). And if you do it to me, don't be surprised to hear a dial tone when you show up on the call. As Dave Winer has been pointing out in recent weeks, there is something quite interesting happening in the blogging/microblogging world. First WordPress allowed posting and reading wordpress blogs via the Twitter API. Then yesterday our portfolio company Tumblr did the same. John Borthwick has been advising companies for a while now to build APIs that mimic the Twitter API. His reasoning is that if your API look and feels similar to the Twitter API then third party developers will have an easier time adopting it and building to it. Makes sense to me. If Facebook were to implement the Twitter API that would be it. We'd have another FTP or HTTP or RSS. I'm still trying to wrap my head around all of this and the implications of it. And I'm not writing here in my capacity as an investor in Twitter and Tumblr or a board member of Twitter. I just think its fascinating and worthy of discussion in this community. So let's get on with it. My friends in the music business would always say things like "we scanned 25,000 units last week". In a world where the sales of CDs (and before that albums) was the key goal, it made sense. Scans were revenues. But the world has changed and more and more music is available on the Internet for free or via subscription services every day. And just because you scanned a record, doesn't mean you listened to it. I think it is time to stop focusing on scans and start focusing on listens. But how do you do that? I bumped into my friend Spencer Hyman yesterday at breakfast. Spencer used to run last.fm. I asked him if you could use last.fm as a panel, like Nielsen or comScore, to measure music listens. He said you could but you'd need to do some statistical weighting by geography and genre. If you look at the last.fm charts for 2009, you'll see that Lady Gaga was most listened to artist on last.fm with 755,000 different listeners and 18.5mm "album scrobbles". If you go to the Lady Gaga page on last.fm you'll see that her song Poker Face has been listened to 235,000 times in the past six months. If you think of the people who scrobble their listens to last.fm as a panel, then you can scale up these numbers to get to worldwide listens. Last.fm hasn't done this work but they should. They could be the new soundscan as the key metric moves from scans to listens. As an example of why this metric will be increasingly valuable, let's go back to that Lupe Fiasco mixed tape that includes the HP advertisement as a track in the mix. That advertisment track is called HP Skit. Last.fm says HP Skit was listened to 3,850 times last week. Let's say 50x is the right multiplier for this artist and song (it's an educated guess). Then HP Skit was listened worldwide about 200,000 times last week. If that ad is worth a $20 cpm, then Lupe could have earned $4000 in ad revenue last week. All of that is hypothetical to some degree but hopefully instructive. Music is moving from a physical good where scans is what matters to a virtual good where usage and engagement matters. So let's start measuring it correctly. That may help the artists get paid correctly. Tenacity is probably the most important attribute in an entrepreneur. It’s the person who never gives up – who never accepts “no” for an answer. The world is filled with doubters who say that things can’t be done and then pronounce after the fact that they “knew it all along." I agree with Mark that tenacity is a key attribute in successful entrepreneurs. It's hard to see it in a person in the short "get to know you" period you have on many investment opportunities. But if you can get to know an entrepreneur over a longer period of time, you can see it. Avner Ronen, co-founder and CEO of Boxee, showed a lot of tenacity to me a few years back. As I outlined in the post announcing our investment in Boxee, Avner originally pitched us in mid 2007. At that time, they were pitching a hardware play. I said no. Then he came back in early 2008 with an open source software play. I said, "better, but no users". Then he came back in the summer of 2008 with 10,000 users and a nice growth curve. And we closed an investment in November of 2008. He was all over that. I've met Reece and I suspect he's got the required tenacity to be a great entrepreneur too. He's showing it right now as he is building his company, Home Field, and hearing a lot of nos, a few maybes, and just enough yeses to keep him and the team going. Tenacity comes in all shapes, sizes, and sexes. It's an equal opportunity employer. But it's not easy to see and reveals itself over time. If you want to be a successful venture investor, keep your eye out for it. It will lead you to a lot more wins than losses. One thing I've noticed over the years is that most comments on posts over a couple weeks old tend to be comment spam. Disqus makes it very easy to delete comment spam (you just reply to the email with the word delete), but even so it's a bit of work to keep old threads clean of spam. So I've decided to close comments after a post is two weeks old. I hope everyone is ok with that. Please let me know in the comments if you think that's a problem. If you have a disqus powered comment system and want to do the same thing, you can go into the settings page and select a time period for "automatic closing". 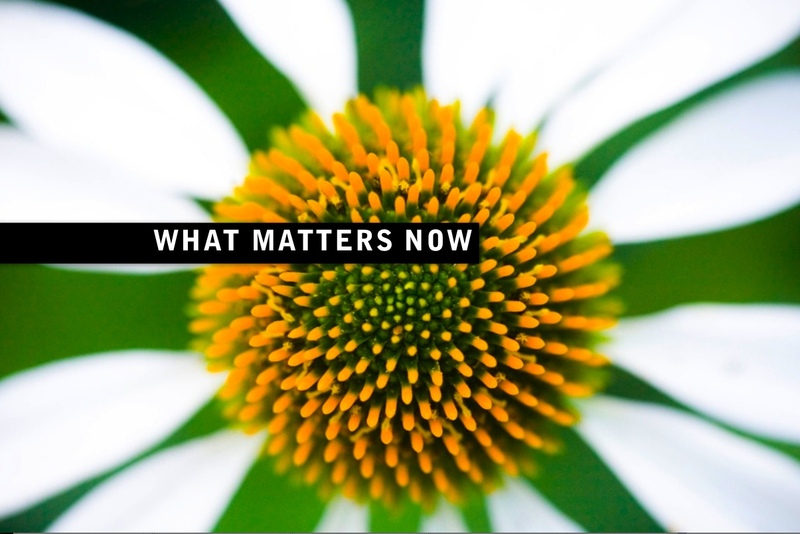 Seth Godin has published a free ebook called What Matters Now. Now, more than ever, we need a different way of thinking, a useful way to focus and the energy to turn the game around. The book features a single page each by around seventy "big thinkers" and I am very pleased and proud to be one of them. Get the book, read it, share it, tweet it, talk about it. Hopefully we'll do some of that in the comments here at AVC. That's a controversial post headline and I don't mean that social will always beat search, but there's a rising chorus out there about "content farms" and search optimized content creation that is worth touching on. Arrington started it when he posted about "the end of hand crafted content". Richard MacManus penned a similar post the same day called "Content Farms: Why Media, Blogs, and Google should be worried". And over the weekend, Paul Kedrosky addressed the issue of search spam in his quest to find the perfect dishwasher. When a web service like Google controls a huge amount of web traffic (>50% for many sites), it's going to get spammed up. Google has thousands of employees working to combat that spam. And it is doing the best it can. But it is hard to beat spammers. The best you can do most of the time is tread water. What's worse, and what Mike and Richard are talking about, is the act of search engine driven content creation. These so called "content farms" look for the top search terms and create content especially for them. Arrington compared this content to fast food; cheap, easy, and ultimately unhealthy. social tools will allow us to decide what is crap and what is not. our social graphs will help us. search engines won’t. it’s a lot harder to spam yourself into a social graph. The Internet is a massive content creation machine. We are witnessing an explosion in the amount of content getting created every day. Most of it is garbage. But some of it is not. Machines can help us find what is good. But with the help of machines, our friends and trusted sources can and will do that even better.